The Quapaw most likely resided in the Lower Mississippi Valley region by the late 17th century. Their villages were composed of clusters of longhouses, in which several families resided. Each village had a leader advised by a council of male elders who independently managed their affairs. Life was ordered by various ceremonies, and family served as the basic unit of social organization. Ancestry was traced through the father, and children adopted their father’s clan, a social unit associated with and named after a respected animal, celestial body, or weather phenomenon. Each clan had specific ceremonial responsibilities and was divided into two groups, the Earth People and the Sky People. The Earth People generally tended to administrative affairs and the Sky People to spiritual matters. The sale of Louisiana Territory by France to the United States, ushered in an era of removal for the Quapaw. Having reluctantly ceded their homelands to the U.S. government in 1818 and 1824, in 1826 they endured a long and terrible march to the Caddo Reservation along the Red River in northwestern Louisiana, which is now referred to as the Quapaw “trail of tears.” In 1833 the Quapaw affirmed their prior cessions and in 1834 relocated to a reservation established in northeastern corner of the Indian Territory. In response to the Dawes Severalty Act of 1887, and the anticipated eighty-acre land allotments it entailed, the Quapaws demonstrated strategic foresight. On March 23, 1893, they agreed to divide their lands into two-hundred-acre allotments, to which subsequent forty-acre parcels were added in 1894. This provided enrolled members with three times the acreage than they otherwise would have received. In 1905 significant lead and zinc deposits were found on Quapaw lands, and its mining led to significant wealth. The peyote religion, later known as the Native American Church, was also introduced to the Quapaw during this period, which served to reinforce longstanding social and spiritual values. The role of hereditary chief continued to serve as the form of principal leadership among the Quapaw until well into the twentieth century. In 1918 the hereditary system of succession ended with the death of Louis Angel, also know as Tallchief (Tahíkašte) who was also a respected spiritual leader. Although he had no male successor, his daughter, Maude Supernaw, continued some of his religious duties until her death in 1972. Since 1956 a business committee has been elected to serve a two-year term as the governing body. Dating to the early 1870s, by 1891 an annual homecoming picnic had become the annual Fourth of July powwow, one of the major summer events among American Indians residing in northeastern Oklahoma, and among the oldest such events in the state. This remains a special time of Quapaw celebration and expression shared with family, friends, and acquaintances. At the turn of the twenty-first century the Quapaw Tribe of Oklahoma numbered approximately two thousand, about one-quarter of whom resided within thirty miles of their national headquarters in Quapaw, Oklahoma. The Quapaw are among the Siouan-speaking people. The Quapaw Language has been passed down from our elders; and is taught in language classes at the Tribal Museum lead by Ardina Moore. Dating to the early 1870s, by 1891 an annual homecoming picnic had become the annual Fourth of July powwow, one of the major summer events among American Indians residing in northeastern Oklahoma, and among the oldest such events in the state. This remains a special time of Quapaw celebration and expression shared with family, friends, and acquaintances. At the turn of the twenty-first century the Quapaw Tribe of Oklahoma numbered approximately two thousand, about one-quarter of whom resided within thirty miles of their national headquarters in Quapaw, Oklahoma. 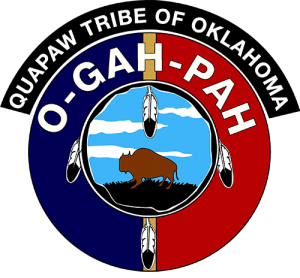 The Quapaw Tribe of Oklahoma has a strong tribal government which seeks to service their people. They also offer many programs and services to their tribal members to empower and uplift them.